There has to be a reason why Patrick Kane is owned in 100% of Yahoo! standard fantasy hockey leagues, right? In case you're still trying to figure it out, the answer is an emphatic Yes! Since breaking into the NHL in 2007-08, the Chicago Blackhawks right wing has done nothing but impress and dazzle and fantasy team owners have benefited greatly, in the process. When you rack up no fewer than 21 goals, 45 assists and 70 points year in, year out and throw no fewer than 191 shots on the cage, too, the hockey world takes notice. Just like it did when the idea of playing Kane at center was being thrown around prior to the start of the year. So far, so good. But can Kane reach greater heights as the anchor of a top scoring line? Not only has Kane embraced his new role as the man in the middle of the ice, he has excelled in it. Through 13 games this season, Kane has manufactured 15 points by way of four goals and 11 assists--an obvious sign that his playmaking skills are only on the rise. But while he hasn't tickled the twin as often as he would like, the 22-year-old is still thinking about it, as he has amassed 45 shots on goal, a Top-20 output, so far. This past week, Kane has been on a mission to prove he's got what it takes to dominate the League. It's being accomplished. How does two goals and five assists to go along with eight shots in three games sound to you fantasy team owners? Things figure to sound even greater moving forward, so make sure they do for your teams. When you flirt with 100 points in consecutive seasons, you automatically earn a spot as one of the top fantasy hockey candidates. Tampa Bay Lightning center Steven Stamkos happens to be one of those players. But much to the dismay of many fantasy owners, the 2008 first-overall selection got off to a rather slow start to the 2011-12 season. He has quickly been able to prove that the season is long and now aims to turn his flirtation with 100 points into a permanent courtship. Will the relationship last? Stamkos is difficult to contain when he's slumping. When he's hot, forget about it. Nowadays, Stamkos is scorching. In his past five outings, he has collected six goals and has thrown 25 shots on the cage. Most recently, he single-handedly led the Lightning to a thrilling come-from-behind victory over Chicago, a game in which he scored a hat trick. He's a Top-10 shot producer (48) and ranks second in total goals (9), but now that he's finding his game, his stat line could be devastating for opponents or, if you're lucky, beneficial to your rosters. The Ottawa Senators weren't thought of as Eastern Conference contender when the season began. Meanwhile, left wing Milan Michalek wasn't thought of as a must-have fantasy hockey sniper. Think again. After one month of action, the Senators are a tough out every night and Michalek is lighting the lamp as much as anyone in the League. Will the underdog of this movie emerge victorious? While there are other more immediate names that come to mind when you search for dominant left wings for your fantasy team rosters, not too many have been more productive than Michalek. The former first-round selection of the San Jose Sharks ranks second in the League with nine goals and has the most power play goals (4) than anyone. He also is a Top-20 shot producer (45 through 15 games). On a team that hopes to rebuild on the fly, Michalek has certainly led the way. And while all that seems like a surprise, consider that the 26-year-old has four 20-plus goal seasons under his belt. On the nights where he doesn't produce on the scoresheet, he'll help your team with via hit, plus-minus, shots. As you build your contender, consider Michalek as a complementary piece. Dallas Stars defenseman Sheldon Souray spent all of last year away from the NHL. Evidently, it was time well spent, as the blueliner with the powerful shot has re-emerged as one of the elite players at his position. Could all his recent success be nothing more than a first-month honeymoon with the Stars? Defenseman don't just accidentally accumulate double-digit goal totals. Not four times, anyway. 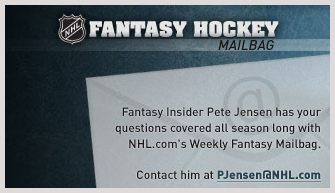 So when they do, they belong in the discussion of premier fantasy hockey players. Souray's resume includes four double-digit goal seasons, including two 20-plus point outings. That's all in the past, right? Wrong. Through 12 games, Souray has four goals already. But he's a balanced attack that's a force to be reckoned with. The four goals go along with six assists, a plus-8 rating, 27 PIMs and 33 shots. Just an early season fluke, right? Wrong. Souray has five points in his past four outings, including two multi-point games. The fact is, Souray is back with a vengeance and fantasy hockey team owners ought to be aware. Edmonton's Ryan Nugent-Hopkins and Colorado's Gabriel Landeskog have stolen the show in terms of impactful rookies of the 2011-12 season. Rightfully so. Another rookie is making his case as a bona fide Calder Trophy contender and his name is Sean Couturier. Will the grind and pressure of an 82-game season yield a moot discussion? The Philadelphia Flyers have done well this season thanks to a surplus of talent at the forward position. Couturier, however, has been a noticeable part of that surplus. Through 14 games, the youngster has collected five goals, eight points and 23 shots. What's more, he's not a liability on the ice, evidenced by his plus-9 rating. Perhaps most impressively, the youngster already has shown he understands the value of consistent production. The eighth-overall pick in the 2011 NHL Draft is riding a three-game point streak, in which he has collected three goals. As he emerges as a nice developmental player or complementary option for the Flyers, make sure he does the same for your fantasy squads.